In addition to their range of popular Glowing Glasses and Porcelain Dome Lights, Kerzenfarm produce Glowing Glass Table Lamps which make a beautiful centerpiece. Made by highly skilled crafts-men and women who painstakingly make these popular products by hand and include very attractive and colourful designs. An attractive and personal gift suitable for many occasions including Christmas, Birthdays, Valentine's Day, Mother's Day, Father's Day, Grandparents Day, Friendship Gifts, Thank You Gifts, Leaving Gifts, Anniversary Gifts. Includes wooden base, 9cm (3.6") diameter x 4 cm (1.6"), and lead, 116cm (46.4"). Mini globe SES 18w screw type light bulb required (not included). Can be gift wrapped and sent with a personal message at no additional cost. Planning a Corporate or Special Event? We can offer discounts for quantity orders. 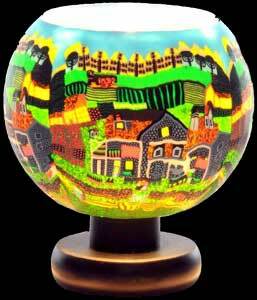 Bespoke designs can also be created, contact beverley@celticglassdesigns.co.uk for a quote. Goods can be shipped worldwide and for most items delivery is 3-5 days in the UK and 5-8 days overseas. Hand-painted glassware items (excluding stained glass giftware) are made to order and so delivery may be up to 7 days in the UK and 14 days for overseas orders. Postage and packing depends on weight and delivery zone (UK, European Union, Rest of Europe and Rest of World), and is calculated at the checkout. UK postage is FREE for orders under 100g. Payment can be made by cheque or postal order, or securely online using WorldPay. All prices are in £ sterling inclusive of VAT at the current rate, but this is refunded for non-EU purchases at the checkout. See our Terms and Conditions for full details. * Please note that the conversion value obtained using the XE.com Personal Currency Assistant is only an indication. What you will actually be charged depends on daily currency fluctuations. The Currency Assistant appears in a pop-up window. This will not work if your browser is set to block pop-ups, in which case you might prefer to use the XE.com Currency Converter.